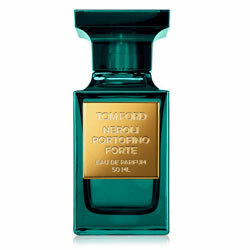 Neroli Portofino Forte by Tom Ford - An aromatic fragrance for women and men. A bold version of the original Neroli Portofino perfume, with a overdose of the core floral notes, blended with Italian woods and leather. Launched in February 2016 and available in an eau de parfum spray at Neiman Marcus. Package Design Original Tom Ford Neroli Portofino bottle with deeper green bottle and gold label. It is well-know (by me) that Tom Ford and I have a lot in common. We love strong women and appreciate great films, and we're both native Texans who later moved to Santa Fe, New Mexico (because it's fabulous). And as it turns out, we're both also wild for the jet-set Italian Riviera destination of Portofino. What's not to like? I recently visited for the first time and stayed at the glamorously old-school Belmond Hotel Splendido, perched on the verdant hills just overlooking the seaside village below, and found the town to be charming - all the ancient terra-cotta porticoes dripping with headily scented vines - with plenty of wine, pizza, and chic leather sandals for all! I could see why Tom (may I call you that, Mr. Ford?) is obsessed: His 2007-launched citrus-and-amber Portofino fragrance, inspired by the town, is a best seller, and the destination continues to be so magical for him that he's adding two more scents to his collection. There's Neroli Portofino Forte, brimming with the smells of the region's bergamot and bitter orange tree. It's joined by Neroli Portofino Acqua, a lighter version of the original that's as refreshing as a dip in the Mediterranean - an indulgence I'm sure Tom enjoys as much as I do.